Henry Flagler, one of Miami’s most ambitious early twentieth century developers, placed most of that dirt downtown to level out the natural bedrock under the city and expand the borders of his vast property. The land is being taken away from an archeological dig on Third Avenue, right off the mouth of the Miami River. The excavation is being led by South Florida archeologist Bob Carr, who undertook the well-publicized first Miami Circle site that was uncovered in 1998. 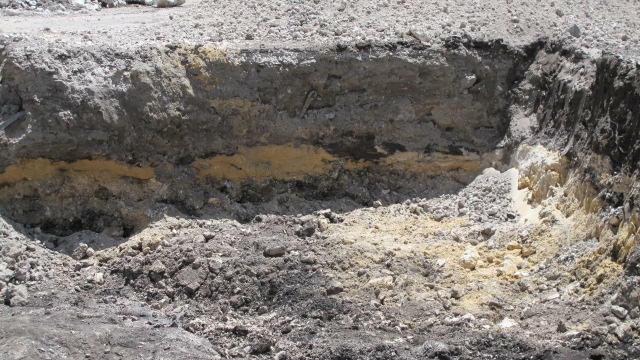 As the fill is removed, you can see the lines of orange dirt, delineating the earth that Flagler deposited from Jupiter Florida via his famous railroad. Fill line showing orange dirt that Henry Flagler shipped in from Jupiter. What Carr and his team have uncovered at the going Third Avenue dig site, where plans for an upscale movie theater are in motion, is of great historical significance, with artifacts and remnants spanning thousands of years of Miami history. In 2005, on the north bank of the Miami River across from the original circle, a second Miami Circle was found. The discovery went relatively unnoticed, though there were some mentions in the press. The second circle, dubbed the “Royal Palm Circle” did not garner the vast attention that the first did. At the time, Carr and his team worked on the Royal Palm Circle site until the economy caused the developer to tighten it’s funding across the board. Both the archeological dig and the development itself were tabled until recently. The project is called the Metropolitan Miami Complex, and includes multiple buildings in the downtown area including an entertainment complex with the aforementioned upscale movie theater. The developer is MDM Development Group in collaboration with the O’Neal group, whose executive team includes former Miami Heat star Shaquille O’Neal. This part of the development is located in one of the last vacant lots in downtown Miami. Work has since resumed and the archeological discoveries have proven wonderfully fruitful. Of great interest is the uncovering of a third circle cut into the limestone, which allows Carr and his team to infer that the circles were living spaces for the native Tequesta. The third circle also assumes proof of a well-developed Native American civilization in ancient downtown Miami. Post holes of the Third Avenue Circle. The team uses PVC to mark each hole. You can see at the bottom of the photo what the holes look like without PVC inside. 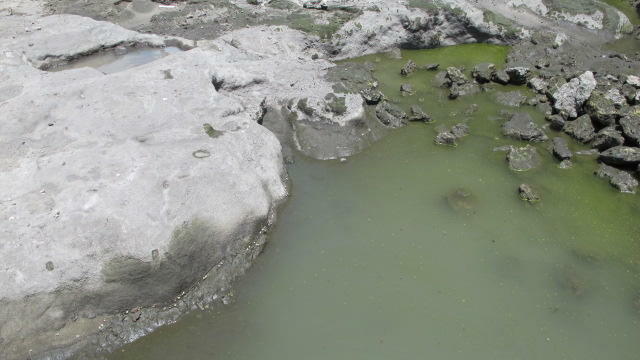 The most distinct evidence of this third circle at Third Avenue is the existence of multiple post holes bored into the limestone bedrock and arranged in a circular fashion. The team believes that holes were resting places for wooden posts that would allow the Tequesta to create shelter. 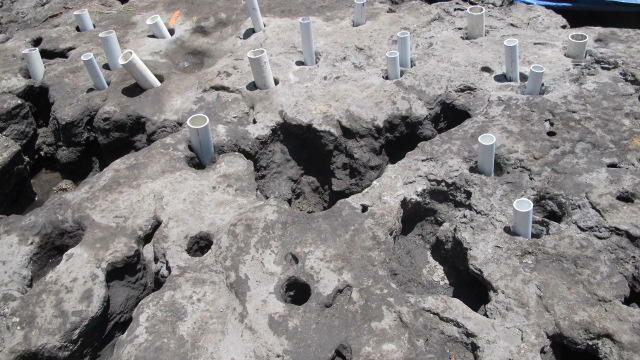 They are currently digging up and running tests on the midden found in the holes. Midden is carbon archeological evidence of domestic life, which can consist of anything from wood, skin flakes, to shells, to animal bones and more. The difference between this third circle and the first more famous Miami Circle is the lack of large stone basins. When initially discovered there was some confusion as to what the initial Miami Circle actually was. This extraordinary find seems to be able to clarify, Carr suggests. It seems that the Miami Circle may have been a more important dwelling, possibly religious in nature, where as both the second Royal Palm Circle and now the Third Avenue Circle are potentially more standard domestic abodes. 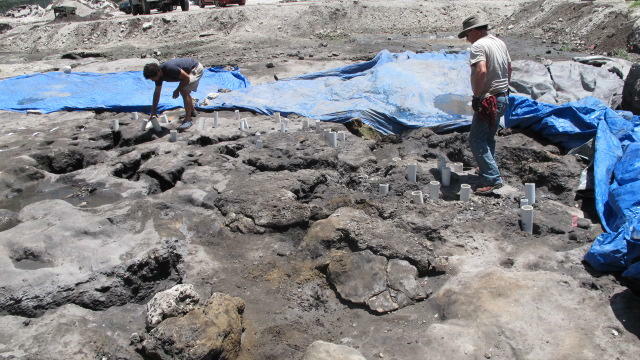 Fascinatingly, the team also uncovered what appears to be the original shoreline of the Miami River in the limestone bedrock, mere feet away from the Third Avenue Circle. The Tequesta probably lived on the banks of the water. Carr and his team believe this to be the original shoreline of Biscayne Bay at the Miami River. Proof of a flourishing Tequesta village, and the original shoreline, are not the only thing the dig has revealed. Carr’s team has unearthed thousands of artifacts dating as far back as 500 B.C. all the way up to the Royal Palm Hotel, built by Henry Flagler in 1897 and torn down in 1930. There was also a freshwater well, pulling from a natural spring underneath Downtown. 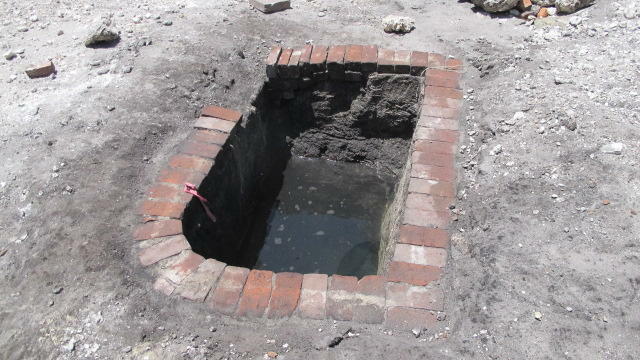 Freshwater well, believed to be from the Royal Palm Hotel. On the far northwest end of the plot, Carr’s team found the outer foundation of the Royal Palm Hotel itself. There are steps leading out of what Carr claims is the ballroom outside to the patio. The steps walking out of what was once the Royal Palm Hotel, much like Henry Flagler once did, are amazingly intact and it is a chilling and inspiring discovery. There are also piles of brick arranged in what appears to be a patio leading out to what would have been a garden space. 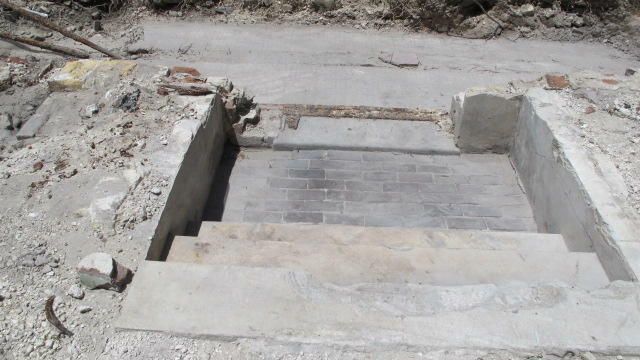 Original steps out of the Royal Palm Hotel ballroom that were most likely walked by Henry Flagler himself. The City of Miami, for its part, is aware of the dig and making sure the developer is following every protocol found in Chapter 23 of the city code, which deals with historic preservation and archeological standards. The developer has already completed the approval and permitting process. According to Luciana Gonzalez at the Historic Preservation Office for Miami, MDM was approved for a Major Use Special Permit in 2005-2006 under the condition that "all efforts will be made to fully document and to preserve [any discoveries] when possible." Most importantly the developer has agreed to build a private park with public access, which will include the Royal Palm Circle on display and an interpretive plaza. Though the Royal Palm Circle will need to be relocated around 40 feet, the plaza will allow visitors to learn about the lush and diverse history of the mouth of the Miami River, and how the Tequesta lived. There has been no decision made on what will happen with the foundation of the Royal Palm Hotel or newly discovered Third Avenue Circle. Any artifacts found will go to History Miami. On the edge of the Everglades, Tansey continues to sift through the mountains of dirt from the site on weekends in hopes of picking up anything the dig might have missed during such a massive operation. "So far," she states, "we have found a 1909 nickel and some round musket balls that might be from the Seminole Wars. We've got a long way to go." For More information about Bob Carr and his team, please visit their website. If you are interested in helping Barbara Tansey sift through the remains of ancient Miami, please visit the Everglades Outpost website. This story now appears at www.archaelogy.org. Four animal-loving Christians have begun a campaign to raise funds in order to construct a replica of Noah's Ark on the outskirts of Hialeah in order to "preserve helpless animals as God taught us." A trailer for Hidden Ark (see below), as the project is called, promises almost exact dimensions of the biblical ark. Animals and all. Having a world-class museum set a few short feet from Biscayne Bay has both its advantages and its headaches. As the Miami Art Museum plans to make its move to future Museum Park, they know this all too well. Movers, shakers, thinkers and doers from the seven counties of Southeast Florida are meeting today in downtown Miami to forge a 50-year trajectory for the region's economy, culture and quality of life. The Seven50 summit is a recognition that the old Dade-Broward-Palm Beach "South Florida" has swelled out of its borders to become a seven-county mega-region with six million residents and a desperate need for shrewd and unified planning.